THE MURDER OF HALLAND is in many ways a perfect "literary" crime novella. In its delicately constructed 157 pages, we come to know Bess, whose partner Halland is mysteriously shot on the third page (one of the old "rules" of crime fiction is to have the murder on page 3). At first confused and defensive at being accused of committing the crime, Bess gradually comes into focus as we witness her thoughts about her past life and the world she and Halland had created together. Or, the world that Bess thought they had created. She thinks she understands why life with Halland, apparently harmonious and intellectually refreshing, was under strain. Bess had been married before but had left her husband Troels to be with Halland, after a five-minute encounter in a bookshop. She had not anticipated that their 14-year-old daughter would not only refuse to stay with her mother but would cut off all contact with her. Bess has been in mourning in the ten years since. In the days following Halland's death, filtered through Bess's mind and unique sense of humour, we meet an assortment of odd neighbours and villagers in this Danish hamlet on the banks of a beautiful fjord. Bess is destabilised by the sudden appearance of Pernille, a heavily pregnant young woman who says she is the foster-daughter of Halland's deceased niece. Bess initially blanks out the revelations that Pernille's presence forces upon her, then, after she is made to acknowledge them by the over-heavy allegory of her discovery of a particular film poster, flees from them. 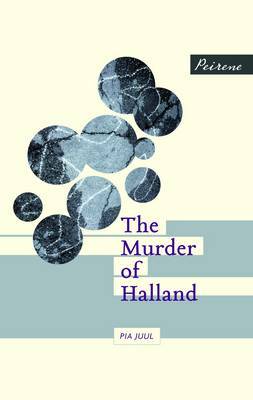 THE MURDER OF HALLAND is a beautifully written and translated novella that is a thoroughly absorbing read. As the preface instructs, it is quite fun to note the quotation at the top of each brief chapter and to relate it to the events described therein. However, as a crime story the book simply peters out. A literary work certainly does not have to obey any genre conventions, and it is fine to leave the reader to answer for herself the questions raised by a text. But HALLAND goes too far in this regard, in that almost any of one's imagined scenarios to explain the many clues and events could be the "truth". This might be satisfactory for some readers, particularly those of an existential inclination, but for me it is not, despite the narrative's charm and its well-drawn cast of eccentric characters.